Ben Franklin once asked "Who is thriving and why?" and "How might they be emulated?" Want to find out? 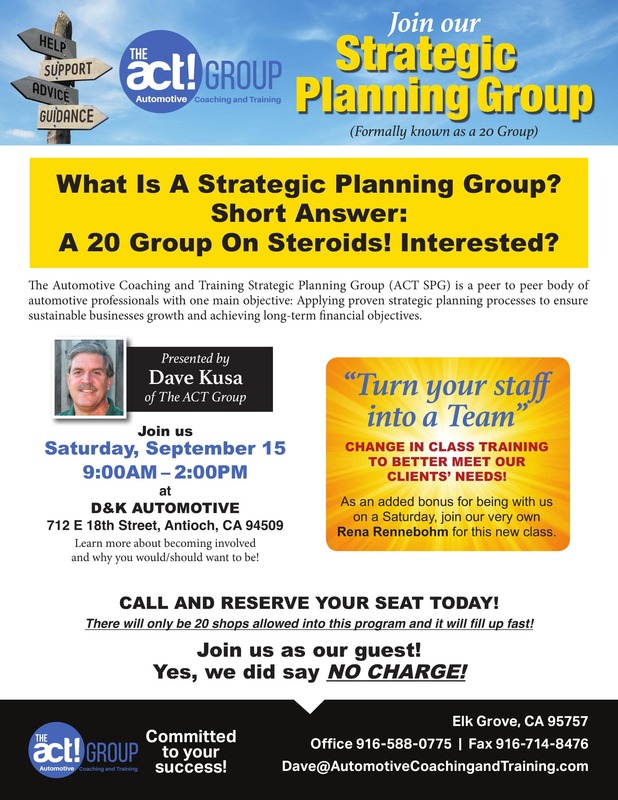 Join The Automotive Coaching and Training Strategic Planning Group. The ACT SPG is a peer to peer group of automotive shop owners that want to strategically plan the successful future of their businesses to grow in the near term and thrive in the long term. Spend time with like-minded people that want to help, and be helped to achieve greatness in business. The Automotive Coaching and Training Strategic Planning Group is for business owners who want to improve their business and who are willing to put the effort in. We are not a Networking Group or a Coffee Club – it is for individuals who are serious about growing their business and who have the discipline to follow through. The Group will meet face to face three times a year for 2 1/2 days at a Group members shop area. There will be topical training on current issues, financial review, goal setting and review, leadership training, as well a comprehensive shop review at the host members shop. You will also be partnered with a shop similar to yours. You will meet monthly by phone with your accountability partner to review your goals, action plan, and financials. You will make connections with some amazing people. Being a shop owner can feel like you are alone on an island. You are not alone! Share your dreams, challenges, and aspirations with like-minded shop owners and you will raise your game. In the day to day battle of owning a shop it is easy to loose track. The ACT Strategic Planning Group will help you stay on track and reach your full potential.